Brian Eno is to release an EP of brand new material in November. Featuring six unreleased tunes from the same sessions that spawned his ‘Drums Between The Bells’ collaboration with poet Rick Holland, ‘Panic of Looking’ is released on November 8th, on vinyl, CD and digital formats. Progressive metal bands Symphony X and Iced Earth have announced they are to embark on a joint headlining tour of the US in 2012. Symphony X’s most recent album ‘Iconoclast’ was released in June via Nuclear Blast Records, while Century Media released Iced Earth’s ‘Dystopia’ in October. 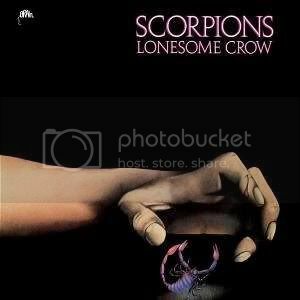 Recorded in October 1971 and released in February 1972, eight years after the band’s original formation, the Scorpions’ debut album ‘Lonesome Crow’ contains just over forty minutes of music which represent a young band feeling their way. Barely touching on the direct style of Germanic hard rock which would become their signature, unsurprisingly, the album isn’t often spoken of very positively among rock and metal fans. This is a great pity since, if taken on its own merits, ‘Lonesome Crow’ contains some superb musical performances, even though it doesn’t really excel in the actual song writing department. Like Thin Lizzy’s debut, or the three criminally underrated discs by Deep Purple Mk I (released between 1967-69), ‘Lonesome Crow’ is an album that isn’t very representative of the band Scorpions would evolve into a few short years later. If it gets mentioned at all, it’s usually for it’s being the only Scorpions album to feature founding guitarist Michael Schenker on all tracks. Looking beyond that, the album ought to be re-appraised for its interesting musical qualities, particularly those from the rhythm section. Combined, drummer Wolfgang Dziony and bassist Lothar Heimberg are fantastic pairing, and while Dziony isn’t always stunning as a drummer in his own right, his interplay with Heimberg is top notch on various tracks featured here. Heimberg, however, is a fabulous bassist, with his complex basslines often lifting the band’s experimentation above mere meandering. It’s Dziony whom gets to open the album; during the intro for ‘I’m Going Mad’, he at first breaks into a fill which sounds like it could power a drum solo, before his toms lay a basic pattern which is intercut with woodblock percussion. This is complimented by a solid bassline from Heimberg which has plenty of peaks and troughs; Rhythm guitarist Rudolf Schenker fills spaces with a basic chord structure, over which his brother Michael lays down a couple of reverbed leads. Aside from a selection of wordless ahh’s, vocalist Klaus Meine is given relatively little to work with initially. Even the inclusion of an early Deep Purple-esque spoken vocal adds little to the general mood, by which point ‘I’m Going Mad’ sounds like a bunch of half-jammed musical ideas welded together in the hope of something igniting. It’s enjoyable in a pseudo Uriah Heep kind of way, but the number doesn’t entirely work as an opening statement. Even when the band hits their stride during the closing moments – with Michael Schenker’s playing featuring a harder edge and Meine’s vocal nearing a full-on wail – there’s a sense that the track ought to have had a little more overall structure. For the next couple of songs, there’s a marked improvement. ‘It All Depends’ demonstrates how the fledgling Scorpions can hold their own in a hard rock environment. This number is a little more direct than the opener, thanks in part to a main riff which resembles Black Sabbath’s ‘Rat Salad’. Also giving a sense of urgency is an extensive use of muted strings – undoubtedly influenced by Ritchie Blackmore’s work on Deep Purple’s 1970 cut ‘Flight of the Rat’ – and Dziony’s Ian Paice-esque drum fills. The amount of general Deep Purple influence cutting through this number cannot be understated; the feel is all there, and the general tone of Michael Schenker’s lead guitar work really hammers the influence home. Even though Meine’s vocal performance is limited to a short verse leading into what is essentially a two and a half minute showcase for Michael Schenker’s ferocious playing, he also seems to relish the brief opportunity to cut loose. While Mr Schenker undoubtedly believes he is the star of this show and we all should be listening to him, nothing he plays is nearly as fascinating as Heimberg’s busy basslines. Heimberg is amazing here and his lead bass work could certainly rival that of anything to be heard on the much bigger albums of the day – be they by Deep Purple, Black Sabbath, Led Zeppelin or Uriah Heep. Uriah Heep could have recorded ‘Leave Me’ as part of their ‘Very ’Eavy, Very ’Umble’ debut. Not only do Meine’s lead vocals occupy a similar space throughout to those of David Byron, but listening to the overblown choir of backing vocals, any comparisons with Heep are absolutely unavoidable. Taking a slightly more laid back route than the previous numbers, Meine is given ample opportunity to stretch his vocals, while Rudolf Schenker’s rhythm guitar work takes an untypically jazzy tone. Michael Schenker’s lead work is superb during his first solo spot, and while he takes an obvious blues-rock stance, his playing is slightly more subdued than previously; he wisely recognises that ‘Leave Me’ is a very vocal piece. He can’t hold it in forever, mind, and for his second turn in the spotlight, the entire band quickens their pace in order for him to shoehorn in a more obvious hard rock solo. The opening bars of ‘In Search of the Peace of Mind’ with its twin leads would suggest we’re headed for a hard rock blast – something more akin to the sound Scorpions would hone to perfection over their next two releases. And then, after a brief foray into Uriah Heep-esque choirs, things take a u-turn. The hard rock mood dissipates as quickly as a balloon struck with a pin, and Schenker pulls out the acoustic guitar. While the main musical refrain is pleasing enough, its flowery nature soon becomes in need of something grittier. That grittiness soon comes, but when it does, it doesn’t quite know what to do to make an impact. Dziony hits harder behind his kit, though never making it far out of the musical starting blocks, while Meine’s rock voice sounds very uncomfortable (and not especially tuneful). A couple of good musical ideas sound like they could be lurking within, but on most levels, this is a tune which just does not work. The atmospheric, spacey ‘Inheritance’ has a similar mood in places, but fares much better due to a top vocal performance and Michael Schenker’s guitar prowess. Those looking for a chorus are as likely to be left wanting (as is most of ‘Lonesome Crow’s wont), but musically, Schenker’s blues runs, rock posturing and general bluster is just about strong enough to carry this number alone. ‘Action’ is one of the album’s best offerings, with the band sounding much tighter than on many of the album’s other cuts. The real draw here is that aforementioned connection between Heimberg and Dziony, as the walking basslines find a great space between the jazz-rock drum patterns. Over the fusion rhythms, both Rudolf and Michael Schenker are able to play a simple guitar line. Simplistic it may be, but it’s just enough to help everything gel. While still somewhat distanced from straight hard rock, Meine’s lead vocal stretches outside of its previous cagey approach, to break into a few louder tenor moments, far more akin to the vocal style he would adopt over the subsequent Scorpions releases. The arrangement is still rather more flowery than that of the Scorpions’ work which would follow, but here, they prove they are capable of hitting hard, and particularly so during Michael Schenker’s brief but sharp lead guitar solo. While most tracks on the album have their moments, everything gets dwarfed by the grandiosity of the title cut, which closes the album, filling thirteen-and-a-half minutes of the albums second side in the process. A long intro featuring drones and echoes gives way to a lead bass riff – clear and precise – accompanied by gentle jazzy guitar inflections and Klaus Meine’s lead voice – booming with a presence rarely heard on the album prior to this moment. Meine has still yet to settle on the signature sound he would adopt from 1975’s ‘In Trance’ onward, and granted, his heavy accent makes any of the lyrics hard to pick out; still, it must be argued this is a powerful vocalist in the making. Despite this, as the rest of the band break in to the track’s first instrumental break, it’s obvious that despite his best vocal efforts, he’s kicked to the kerb by the rest of the band. Michael Schenker’s lead work is bracing, containing a great fiery passion, under which Heimberg plays busy bass runs, possibly surpassing many of his already fantastic performances. At the end of this instrumental tour de force, ‘Lonesome Crow’ could have reached a natural conclusion, since in many ways the track has already reached its peak, but there’s much more to come. After such a rock-filled lead break, it’s time for the Schenker brothers to step back and let Heimberg take control… His bass solo is jazz-rock oriented, and although you’ve already heard Heimberg achieving similar results during ‘Action’, this is certainly no weaker; throughout a couple of minutes, he holds a commanding presence. Dziony backs him suitably with a jazzy backbeat. It’s easy to imagine that both Heimberg and Dziony had been playing with such jazz-rock ideas during quiet moments in rehearsals, but it’s far more impressive that such a jam could take pride of place within such an epic number. Naturally, soon enough Michael Schenker wants back in on the action, and throws a brief solo over the jazz-rock bones. The second half of this long workout is noticeably weaker, since it is entirely constructed of filler and repetition. A couple of minutes of drums played at a relatively funereal pace – coupled with Klaus Meine wailing – really loses momentum. Even the addition of vibrato filled guitar leads does nothing to help. ‘Lonesome Crow’ could have dispensed with these couple of minutes, but it’s soon clear this is mere mood setting, a lull in which to prepare the listener for Michael Schenker’s killer lead guitar work waiting around the corner. Breaking into his second major solo, Schenker’s spiky leads sit atop an equally busy lead bass, with the band settling into the groove which began the number, bringing things full circle. Unsurprisingly, given its preference for experimentation, ‘Lonesome Crow’ was not a great commercial success. Back in the early 70s though, bands were rarely dumped straight away if they were not an overnight sensation: and luckily so for Scorpions, since they obviously came with plenty of potential – they just needed more time to refine their sound. Their name may sound like a community choir, but Australian band The John Steel Singers aren’t named after a man. John Steel, in this case, refers to a small toy horse named by frontman Tim Morrissey. Since their choice of name leans towards the surreal, you would perhaps expect their debut full-length release to be quirky, and it many ways it is. But make no mistake, quirky in this case doesn’t usually mean humorous or novelty; ‘Tangalooma’ blends various 60s influences and serves them up with a hint of 90s alternative rock, sometimes achieving interesting results. ‘Evolution’ presents The John Steel Singers in one of their most accessible moods. There’s a solid bassline, banjos and occasional reverbed guitar fills, served up with a choir of voices. If that wasn’t enough to convey a certain kind of sunshine pop, there’s also a bit of brass thrown in for good measure. With the bouncing, almost march-along nature of this number, a reasonable reference point for this would be Mercury Rev during one of their more throwaway experiments meeting Small Faces on one of their cockney walkabouts (or perhaps ‘Care of Cell 44’ by The Zombies, albeit with none of the sparkle which makes that tune so endearing). If they were going for feel-good, they’ve had a good stab at it hit here; it’s worth remembering how difficult it is to convey this kind of mildly eccentric groove without venturing into annoying territory (which is something The John Steel Singers fall foul of elsewhere on the album, with a relative regularity). Far more interesting – though still accessible – ‘Toes & Fingers’ uses lots of 60s influences during its opening verse. A hushed vocal sits atop a slightly haunting arrangement of bass and piano, punctuated by simple glockenspiel notes. The vocal harmonies – although slightly dark – are spot on; and then, just as you think you know what’s in store for the rest of the number, the band change tack completely. Things then move into a more upbeat arrangement, driven by Dion Ford’s bass; a choir of vocals chip in, as the glockenspiel takes on a busier role – and it’s hard not to think of Norway’s Team Me. As the vocals take a stap back, muted trumpets fill the space, while other passages are dominated by retro twanging guitars. Being two or three musical ideas glued together, it shouldn’t work, yet somehow it does… It’s definitely the album’s stand-out track – and by some distance. ‘Cause of Self’ has a darker vibe, thanks to a great reverbed guitar part and unexpected piano accompaniment. Vocally, the slightly hushed tones add to a relative unease, and upon first listen it’s impossible to second guess how the number will end. 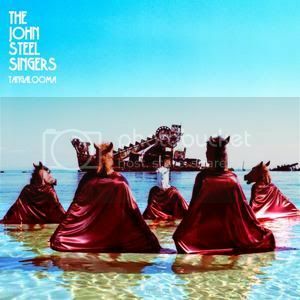 While The John Steel Singers are clearly in experimental mode here, lots of the track’s subtler elements are crushed by a ringing rhythm guitar which drowns out half the track. If the band wanted to unsettle their listeners, they’ve succeeded. It’s a reasonable number in all, but one which would definitely have been better without the noisy guitars. ‘Once I’ has an unavoidable 60s influence, but delivered with the band’s own style. Here, over a four-four time signature which often sounds as if it’s desperately trying to break into something more interesting, there’s a selection of banjos, trombones and retro keyboards. Its gentle air could have been soothing, but as with much of The John Steel Singers’ material, the idea it could break into an unknown quantity at any moment takes away any idea of comfort. ‘You’ve Got Nothing To Be Proud Of’ showcases more sunny grooves – the electric pianos and upfront basses add nice flourishes throughout, while a multi-layered arrangement shows a great understanding of a band’s ability to really get the most out of their studio environment. The music often much better here and, as such, the slightly discordant vocal can be overlooked – after all, being slightly out of tune never hurt Stephen Malkmus. A slight Beach Boys vocal style permeates ‘Dying Tree’, a number with a very dark edge. Plenty of reverb a plenty unsettles what could have easily been an otherwise easy to like sixties pastiche. Looking beyond the reverb, though, there are some decent harmonies on show and an interesting – albeit sinister – musical base. It’s not a number which stands out at first, but perseverance could uncover what is potentially one of ‘Tangalooma’s best offerings. Beyond those numbers, this album is a mixed bag of potentially failed experiments. With another marching beat, ‘Overpass’ should have been a bedfellow for ‘Evolution’, but the band take their Zombies-ish marching pace to extremes – almost to the point of absolute annoyance. Yes, the bass line is solid and harmonies are fairly tight, but the end product is best described as grating. The only respite comes from a couple of brief sections which hint at psychedelia, but these are duly stomped over by the rumpty-tumpty marching band. Possessing a tune which rarely changes from its original three or four opening bars, ‘Rainbow Kraut’ – aside from having a really awful title – treads a fine line between trashy and mildly eccentric. At first, the staccato guitar riff sounds like its building up to something more interesting, but it never goes anywhere. The mariachi horns provide a small amount of interest during the closing section, but no matter how good, these are really no substitute for a chorus (sadly missed). Parts of this track sound like something the band found among Frank Black’s pile of rejects. After a few plays, it sounds better than it did on first hearing, but then again, a few spins after that, it’s somewhat of an irritant once again – and barely recognisable as being the work of the same band capable of something as good as ‘Toes & Fingers’. During the short acoustic number ‘Great Divided Self’ the band sound like they’ve stopped trying altogether. The vocals and guitar sound like a busker, which could be excused if the material was of a better quality, but sadly it sounds like something which was tossed off in ten minutes. Despite their off-days, this band has something. It’s not always obvious what that something is, but whatever it may be, it was enough to entice ex-Go Betweens man Robert Forster and Animal Collective’s Nicolas Vernhes on board this project (the pair take on producing and mixing duties respectively). As such, the production is always great, even when the band’s material doesn’t quite work. And when the material works, The John Steel Singers have a fair amount of potential. ‘Tangalooma’ presents a handful of attention-grabbing ideas; ‘Toes & Fingers’ in particular sounds like the work of a very interesting band. If they could have been a little less reliant on marching beats and move farther towards the dark psychedelic elements they’d hinted at on a couple of tracks, it certainly would have been a step in a better direction. Released as part of the career spanning retrospective ‘Part Lies, Part Truth, Part Heart, Part Garbage’, REM’s final single ‘We All Go Back To Where We Belong’ has two video clips to support the release. The minimalist videos – clearly influenced by I Am Kloot’s ‘Proof’ clip, starring Christopher Eccleston – feature performances by John Giorno and Kirsten Dunst. You can see them both below. Read a review of REM’s last studio album, ‘Collapse Into Now’ here.